The Herschel Inspire Mirror offers a two-in-one, premium heating solution for bathrooms, en-suites, and bedrooms - keeping your spaces warm and providing a reflective mirror surface at the same time. Especially useful in bathrooms, the Inspire Mirror prevents condensation, becoming an indispensable luxury that you can't live without. View Herschel Inspire Mirror datasheet here. All our electric heating panels can be easily fitted with basic DIY knowledge. They simply screw to the wall and plug into a normal 13amp socket. Please note that Herschel Inspire panels are not supplied with a plug - you will need to purchase this separately and attach it to the cable if you want your heater to have a plug-in fitting. A template is provided to show you where to put the screws. If you prefer a discreet fitting with no wires showing you may want to have the panels professionally installed by a registered electrician. Efficient, stylish and discreet, Herschel Inspire Mirror Panels use far infrared heat to warm rooms comfortably and efficiently. The heated glass makes them ideal for use in bathrooms, where they’ll resist condensation even in the most humid conditions. This 250w version is the smallest in the range - the perfect choice for private en-suites. 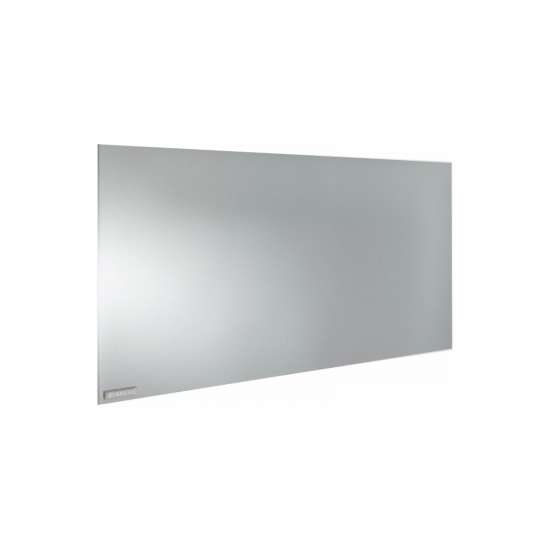 Herschel Inspire Mirror Infrared Panels are fully functional, stylish household mirrors – but when switched on, they also provide energy efficient infrared heat, one of the most economical ways of heating a space. The panels are lightweight and slimline, comprised of a sheet of heated mirror glass and a steel rear panel fitted with easy mounting points for DIY installation. The heated glass is ideal for bathrooms, providing a bathroom mirror that won’t fog up, even after a long bath or a hot shower. Herschel Inspire infrared heating panels are easy to install as a DIY job. All you have to do is purchase a separate plug, attach it to the cable and mount the panel on the wall. Full installation instructions are provided. Alternatively, if you’re using in a bathroom, or you prefer a more discreet fitting with all wires hidden, the panels can be hardwired by a qualified electrician.